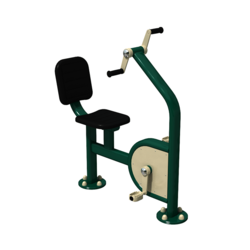 Pioneers in the industry, we offer push up and dip station, double skiing machine, triple waist twister, sit up board, double arm wheel and pull chair from India. The Push-Up and Dip Station is one of the best developers of upper body strength. 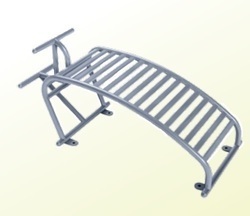 The bars allow correct position and a full range of motion while avoiding contact with the ground. The Double Skiing Machine is an exercise station that wholly delivers cardiovascular benefits by stimulating the cross-country skiing motion. The exercise completely avoids the impact stress that runners often experience on feet, hips, lower back and knees. This equipment comprises of three rotating pods that help stretch the internal and external oblique and add emphasis on the abdomen region and muscles of the spine. The Sit-Up Board is compact and lightweight equipment for muscle group workout. It is very appropriate for school-age children and young adults, can also be used by anyone. There are two distinct positions on the Sit-up, one with the feet down and the other with the feet up, held under the support bar. 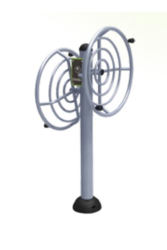 Arm Wheel is a widely used outdoor fitness equipment designed especially for working on the shoulder muscles. The machine works in various directions and stances giving an all-around experience. 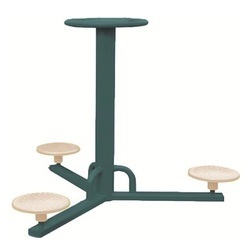 The equipment can be installed at a variety of heights making it perfect for all ages. Make the shoulder joint more agile and flexible. 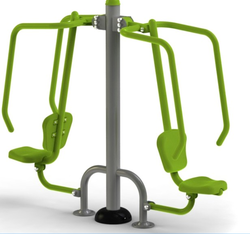 Pull Chairs is an extensively used outdoor fitness equipment designed especially for enhancing the flexibility of upper body and delivering cardiovascular benefits to the exerciser. Push Chairs is heavy gauge steel, self-weighted machine built to support a vigorous workout for up to two people. This piece of equipment delivers basic muscle toning and strengthens upper body and back muscles through self-weighted exercises. • Good for healing muscular atrophy, frozen shoulders, tennis elbows etc. 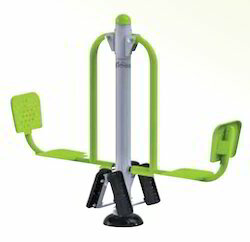 The Arm and Paddle Bike combines both cycling and upper arm exercises. Coordination between the leg and arm movement encourages balance whilst exercising. 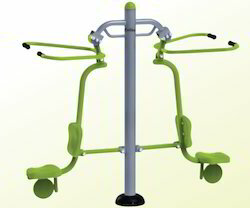 Dimensions : 1120*850*1260 mm Air Swing is the widely used outdoor fitness equipment designed especially for building up strength of arm muscles and stretching of oblique. The Leg Press is an extremely important exercise for toning up of lower limb’s muscles. This equipment provides two Leg Press positions, each with a different level of resistance. Additionally, one may choose to use the piece of equipment to perform calf raises in a seated position, one or two legs at a time. 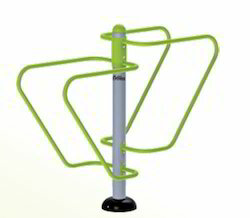 Fitness Rider Station is the widely used outdoor fitness equipment designed especially for Pneumonic function by enables full movement of limbs. 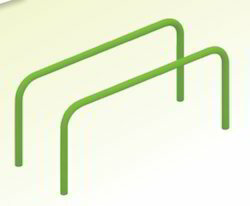 The Parallel Bars also known as chin up bars is an exercise equipment that are set at different heights to allow strengthening and building of arms and shoulder muscles. It can also be used as support for a wide variety of stretching and leg strengthening exercises. 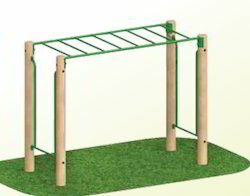 The Monkey Barsis a heavy-duty fitness equipment that can be used by fitness enthusiasts of all ages and offers various activities. 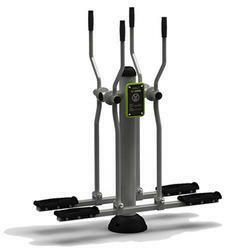 The exerciser walks hand over hand the length of the horizontally placed ladder making it a strenuous exercise. 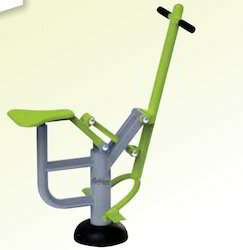 We are the manufacturer of Outdoor gym equipment . Our outdoor fitness equipment designed especially for enhancing the flexibility of upper body and delivering cardiovascular benefits to the exerciser. 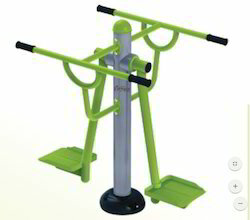 Looking for Outdoor Gym Equipment ?